Ixalan previews should be starting next week, to match with the pre-previews that are being officially released due to geotagging and if you want to ignore the unofficial leaks, I respect that. We are looking for any of the following factors, or a combination thereof: Modern use, Legacy use, Commander use, Cubes, and other casual play. The more of those groups that want these cards, the better a bet they are. The caveat, as always: We don’t know what will and won’t be reprinted. FTV: Zendikar could happen. We’ve got several Commander 2017 cards that should have been reprinted but weren’t, and a lot more that it’s a relief that they did get reprinted. Foils are not a totally safe bet either, with Masters sets and Conspiracy and special releases, but foils can go up if the nonfoil is reprinted in a set like Commander 2017. Nahiri, the Harbinger ($10 regular/$35 foil): The foil is at the upper end of where I’d expect a card to be, and that’s because she’s really good at what she does. Exiling permanents is quite powerful in Commander, but you have to tap the creature or artifact first. It’s unlikely that she’ll nail a Darksteel Forge, for instance. She pops up in Modern from time to time but never with frequency and isn’t the focus of a deck. I want to wait and see if she falls a bit further, as $10 is too high for my taste. I’m more comfortable getting in at $7 and playing a long game. Relentless Dead ($7.50/$15 foil): I’ll be honest: I had a stack of these that I picked up when this was around $5 and moved out at the spike. This is an amazing tribal card in one of the most resilient tribes, and it can do some truly disgusting things in Commander. I’m surprised that the foil is so low, and this is one of my top targets at rotation for long-term growth from the casual market. 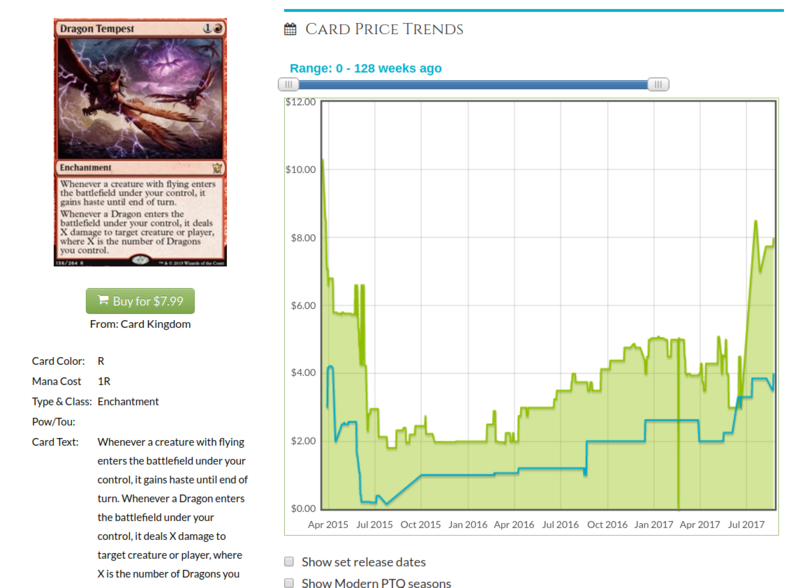 I would prefer the card to get cheaper, but the $15 foil is incredibly tempting. Zombies would seem to be a lock for the next time the Commander decks get tribal, and the foil will be much more resilient than the nonfoil in such a case. Archangel Avacyn ($6/$15): She’s got one hurdle to clear: FTV Transform in November. I’m hoping she’s trickled down to $5, and if she dodges reprinting in that set, the difficulty in printing double-faced cards means she’s probably safe. Startled Awake ($5/$8): Now this…this is a foil I want to have, but I can’t shake the FTV idea for this either. It’s a powerhouse mill card, and it’s reusable, and casual players are why Fraying Sanity isn’t a bulk rare. There’s only about 50 foils on TCG, the multiplier is low, but I’m not moving till that FTV list is out. Arlinn Kord ($4/$8): We are now in an era where there’s enough planeswalkers to fill out a Commander deck easily. That means mediocre ones like her aren’t guaranteed to grow. She’s cheap, sure, and pops right into your Werewolf tribal deck, but it’ll take so long to grow that I don’t think she’s worth it. Tireless Tracker ($4/$11): I’m picking up foils of this as fast as my budget can stand. There’s less than a hundred on TCG right now, and that includes prerelease foils. What you need to know is that this is popping up in several Modern decks as a value engine, and even in the sideboard of Lands decks in Legacy. This will be going up, and it’ll spike into the $20-$30 range when it settles. Traverse the Ulvenwald ($4/$13): Another card with a relatively low number of foils on TCG (less than 80 total as of this writing) everything depends on which build of Death’s Shadow you like in Modern. If you like the Grixis better, this is worthless. If you play a version with Tarmogoyf, then you want four Traverse. These are not going to go down much, but I like the foils more for a spike in the next year, with nonfoils coming along for the ride. The Delirium mechanic makes it a little less likely to be reprinted soon but nothing is for sure. Thalia’s Lieutenant ($1.50/$3): I dearly love this foil at $3, for two reasons: First, it’s an automatic four-of in any competitive Humans build that might pop up in Modern. A couple decks have tried, but no traction yet. Second, as a tribal enabler in foil, it will go up, even if the card is reprinted in a future tribal set. The nonfoil has taken a small hit, but it’s in the Dragon deck, so the foil is where you want to be. Grab your foil Lieutenants now. The Gitrog Monster ($1.50/$10): It doesn’t seem like that long ago, when all kinds of stuff was spiking madly due to his use in Commander. The enormous foil multiplier remains a strong sign of his appeal there, so picking him up now is an investment in slow growth over a very long term. Seasons Past ($1/$3): I’m pretty bullish on this, especially for such a cheap foil mythic. We’ve already seen that with a tutor, it’s viable in Standard, so imagine the work it’ll do in Commander. This is probably not going to spike, so you’ll be on the ‘stick in a box and be patient plan’ that has served well for a number of EDH cards. Prized Amalgam ($1/$5): It’s been pointed out as an easy target, and it has a surprising foil multiplier for a card that’s hard to use in casual formats easily, but this is easy mode. It’s a four-of in a Modern deck that comes and goes in waves, $5 for the foil is too cheap. 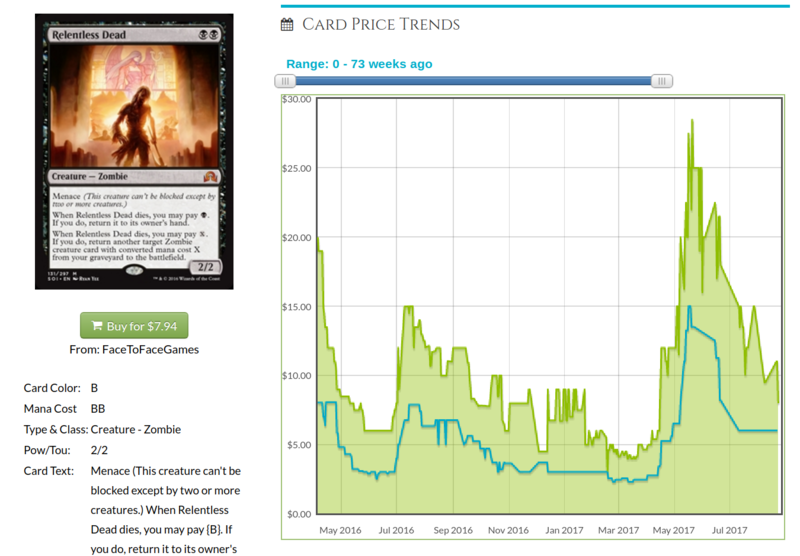 It’ll spike to at least $10 after it does well on camera in some event, and with Modern being back on the PT, it might spike a lot harder. Duskwatch Recruiter ($1/$4): Not only is this difficult to reprint, it’s one of the ways the Counters Company deck can instantly win, finding Walking Ballista at instant speed. It’s also a fantastic place to dump mana in Commander, and as an uncommon, there aren’t even any prerelease foils to mess with. TCG currently has 23 foils in assorted conditions. I would love this a whole lot more if it didn’t feel like a very strong contender to be in the FTV this November, so as you can tell, I’m hesitating until we know what’s in that set.